Taking guitar effects to new heights at astonishingly affordable prices, the Zoom G1Xon is an amazingly versatile effects pedal destined to become an instant favourite in your arsenal of guitar accessories. Whatever your musical preference, whatever your level of expertise, the Zoom G1Xon Guitar Effects Pedal is sure to expand your creativity and offer a myriad of ways to mix up your sound and style. The bigger brother of the G1on Pedal, the Zoom G1Xon Guitar Pedal holds 5 extra stunning effects and a built-in expression pedal to control input level, output level, or any selected effect parameter. 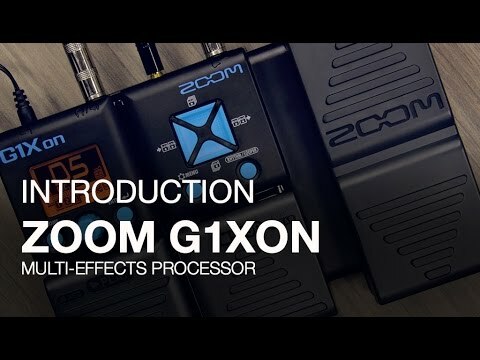 The Zoom G1Xon Guitar Effects Pedal offers 80 spectacular and mind-blowing effects, including a wide variety of distortion/overdrive, dynamics, filters, reverb/delay, modulation and special effects, and even offers amp models from legendary amps gone by. And that's just the start of it. Up to five different effects can be used simultaneously, chained together in any order you prefer. Once you've found the effects you want, you can easily tweak the levels to make it perfect for you, you can then save the effects forever and ever, so you'll never lose out on your signature sound. All guitarists know the importance of playing in tune, Zoom do too! The Zoom G1Xon Guitar Effects Pedal has an integrated guitar tuner to take all the stress out for you. The tuner is accessible at any time, just step on the two pedals together, and the LCD screen will immediately tell you whether your notes are in tune. The tuner carries a variety of standard tunings and even a knowledge of drop tunings of up to three semitones. The Zoom G1Xon is fitted with an innovative onboard looper function, that helps you expand upon chord progressions or licks, or to create a wildly adventurous solo over the top of your looped rhythm sections, perfect for when you're practising or performing alone. The looper allows you to layer up to 30 seconds of high-quality audio (16-bit 44.1kHz), using the effects of your choice. Starting and stopping the loop is as easy as pressing the pedal, absolutely no hands required! The looper can also be used in conjunction with the Rhythm function. Speaking of the Rhythm function, the Zoom G1Xon Guitar Effects Pedal contains a rhythm function that carries 68 realistic samples of actual drums playing real-life patterns of a variety of different genres. Rhythm is an essential part of playing the guitar to the best standard, and the Zoom G1Xon not only makes it easy to learn but also really fun to learn too. The Zoom G1Xon Guitar Effects Pedal can be powered with the Zoom AD-16 AC power adapter which plugs into any standard wall socket. However, for extreme portability, the Zoom G1Xon can also be run on just 4 AA batteries. If powered by using batteries, the G1Xon will automatically power up once a jack is inserted into the input, and what's even more impressive is that the G1Xon will run for more than 20 hours of continuous use, and you can use the LCD Display to find out exactly how much power is remaining. Zoom has added an "eco" function that will power down the unit if it hasn't been used for 10 hours. Battery: AA size (LR6) battery x 4 Continuous battery operation time: 20 hours when using 4 AA alkaline batteries.